If you're friends with my mom on Facebook, you've probably already seen (and heard) enough or too many stories already. But this few days have been pretty exciting. On the 1st of June, we left Kuala Lumpur and flew 12 and a half hours to Paris. I thought I could at least catch a glimpse of the Eiffel Tower, but all I saw was fog, fog, and more fog. At least I got to watch some movies on the way here (Little Manhattan is great and you should watch it if you get the chance). The airport was architecturally fascinating, and so were their accents. The five hour layover at the Charles de Gaulle airport was long. Mainly because we were only allocated fifteen minutes of free wifi. I still hadn't gotten into rhythm of travelling, going through customs and all that, so we got a little lost before finding the right gate to wait at. Finally when it was time to board our next flight to Chicago, the gate changed and we had to walk all the way the other end. We had to go through a mandatory security interview before we boarded the plane. Even though we all spoke English, it was hard to understand what she was asking us about but we for through eventually. Then, it was nine hours from Paris to Chicago. This flight felt a lot longer because they didn't provide us with individual screens to pacify our boredom. At this point I had no idea what time or day it was until the captain announced it as we landed. Even then, I wasn't sure if it was am or pm. Twenty one and a half hours of flying, and I still hadn't gotten the chance to sit by the window and gaze out into the clouds. Chicago was quite a blur. We went through multiple baggage checks, went to the terminal and had it changed last minute again. The flight got delayed about an hour and it was a really small plane and my guitar couldn't fit in the baggage compartment, so we had to check it in. I was supposed to get a window seat, but because my guitar couldn't fit, I had cause a traffic jam of people behind me and had to switch with the person next to me so my mom helped me take pictures of the clouds. We arrived in Nashville at about 9pm local time, 4am in Paris time, and 10am KL time. Confused? I sure was. But I was determined to beat jet lag. I went to sleep around midnight local time and woke it the morning. I guess constantly wondering if I'm crazy for doing flying to the other end of the world can be pretty exhausting. Jet lag= 0 Me=1. We met with the owners of the hostel the next morning, and they briefed us about what we were supposed to do. We would be volunteering at the hostel during our stay here. I'm quite excited. We didn't do much all day as we won't be starting our volunteer training until tomorrow, so we got some groceries and then hung out in our room. In the evening, we walked to the Belcourt Taps to see Megan and Liz. It was great. I've watched their youtube videos for so many years and finally got to see them live! After that, we stayed on to listen to Ira Wolf and Zack Joseph perform. They were incredible! It was quite a shame that most of the people in room left when Megan and Liz left. We bought their CDs and then took a taxi back. Now its 1am and we just Skyped with everyone back home. It's getting late/early, I'll write more later. The sun played hide-and-seek with us for most of the week. It rained and then it stopped, it rained and then it stopped. I've been volunteering at the hostel, and I'm enjoying it a lot. Maybe I'm enjoying it more than I should. I fold the sheets, clean the floor and stuff like that. I learnt that its not always about doing what you love, but its also about loving what you do. On Wednesday, a day before the festival, my mom and I went to Commodore Grille to try my luck at the Debi Champion's writers night there. We got there really early because we had planned to walk but Kodi, the person who was training us on working here offered to drive us there. While waiting we met a 'singing concierge' Tommy. He is a songwriter and, he talked to us about the music industry and gave us advice on what we should do. I ended up being the first to sign up. If it is your first time playing here, they make you wait until everyone who is scheduled to play is done. It's like they are testing your patience, but at the same time you'd get to learn a lot about songwriting. There were 7 rounds the night, and it was 3 hours of awesome songwriters play. I was in the 8th out of 9 rounds and I was so nervous. I met these two singer/songwriters, Camille and Anthony from New Jersey. It was their first time here too. Their songs are amazing, and you should totally check out their music: https://www.facebook.com/camilleperutomusic (I can't seem to find Anthony's page). At the end of the night, I thanked Debi and she gave me a hug. She is so nice and kind. We walked home and got home pretty late. I was too exited to sleep. 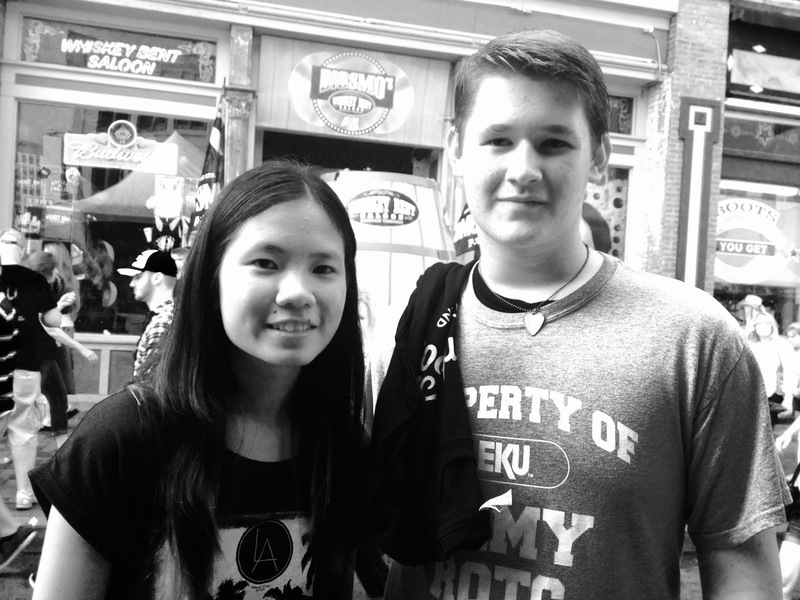 The next day was the start of CMA Fest. It was really fun. After I did my hours at the hostel, I walked over to the festival. Through all this, I'm learning so much about music and everything else too. I'm learning how to speak more, because everyone here talks a lot. They greet you with "Hi, hows it going?" or "Hey, how are you?" and sometimes, I don't even know that person but its just a general greeting. On the first day, I got to see Charlie Worsham and Cassadee Pope perform at riverfront. He even came down and took photos and interacted with the people in front during soundcheck and Cassadee Pope is even better live than on TV, if that is even possible. I also went to the Martin Guitar booth where I sang at two years ago, and saw the same people I met then! They even remembered me, which I find very surprising because thousands of people pass by their booth each year. I sang a song and they gave me a t-shirt. They told me to come back again, and because my mom wasn't with me then and I wanted to show her this booth, I told them I would. 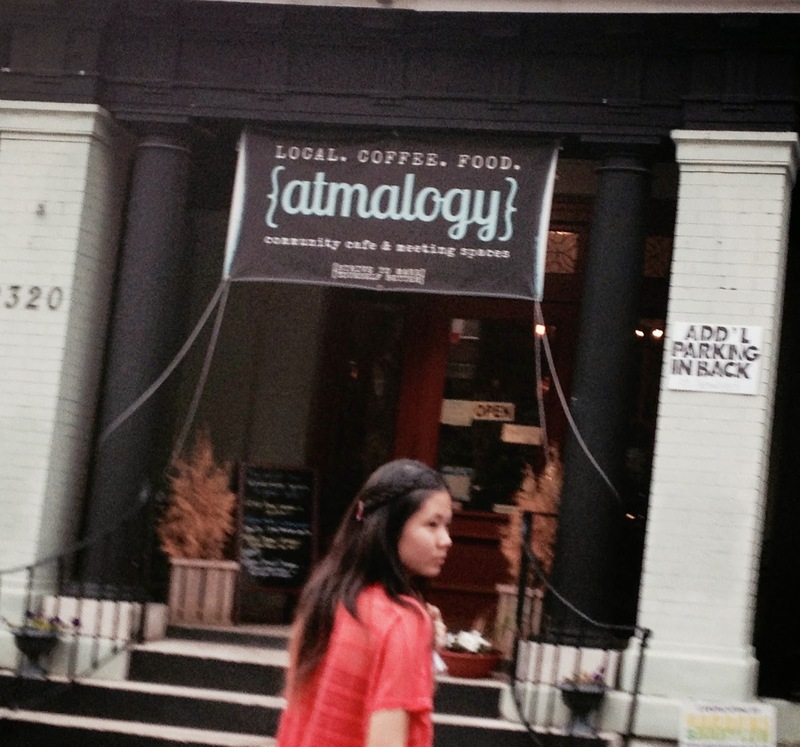 In the evening, we went to a place called Atmology. 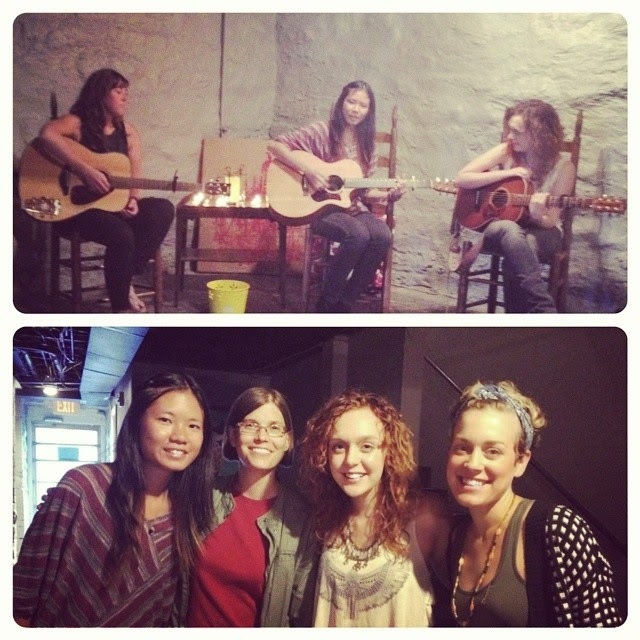 Ella Mae Bowen, Melissa Fuller, Hailey Steele and Lizzy McAvoy were singing in a writers round that evening. Ella Mae Bowen is my hero, and I was so excited to see her play. The show was set up like a living room and the atmosphere was very relaxed. Everybody's songs were so good, and so honest. I just sat there, amazed. It was the best writers round I had ever attended. The next day after working at the hostel, I got to watch Danielle Bradbery perform. I got to riverfront just in time for her set. It's crazy to think how far she has come, because I used to watch her on The Voice on youtube and now she's one of the main performers at CMA Fest. I was walking downtown and saw this group of kids busking, so I gave them a dollar and took a picture. 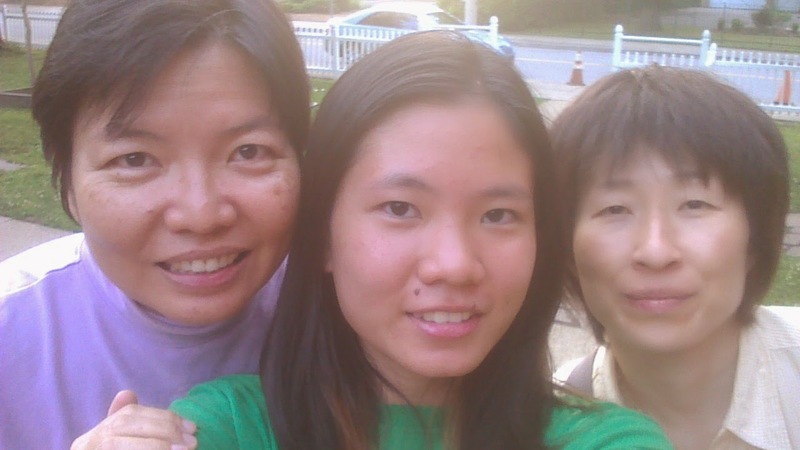 Mom and I made friends with a Japanese lady, Yukiko staying at the hostel, and I took her around broadway. It was really, really hot. 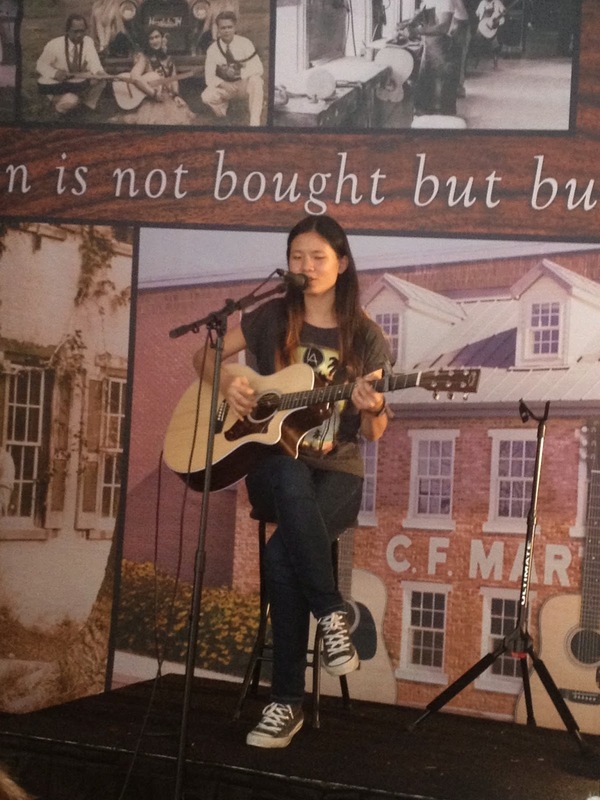 On friday, I played at the Martin Guitar booth again. I sang 'Dandelion Days'. After me, someone sang 'Wayfaring Stranger'. He later introduced himself as Steven. He plays the mandolin really well and his mom showed mea video of it. He even let me play his mandolin, but I didn't know any chords. I also got to perform at Hotel Indigo that night. It was a full 30-minute set. I was so excited about that. I got there early but the organiser wasn't there yet. While waiting, I met Marta and her husband, Federock. They both make up the duo '12 Notes'. They were scheduled to perform as well. They flew here from Italy to do country music, isn't that awesome? I was the first to perform. If was quite a rush, and was over before I knew it. Two years ago I didn't even have enough material to fill up 30 minutes. I was nervous at first, but then started enjoying myself more. 12 Notes came on a few sets after mine, and my mom, Yukiko and i stayed on to listen. They're the most happy and positive people, and it just makes you happy listening to them. We enjoyed their set a lot. During the last two days of CMA Fest, I got to watch Ella Mae Bowen play again. I also got to see Kelliegh Bannen and David Nail perform. David Nail is awesome (am I using the word awesome too much? I might just need to widen my vocabulary). My favourites are 'Whatever She's Got', 'Red Light' and 'Let It Rain'. And he sang all of those songs and more. Everything doesn't quite feel real. On monday, I worked at the hostel till later in the afternoon. I wanted to go to the Bluebird Cafe, but I was scheduled till 5.30 and would not be able to make it there in time. I ended up finishing by 3.30 and there was a chance I could go. When I got back, there was still quite a lot to do so I decided not to go but Ron and Tracee, the hostel owners said I should go. They were going out anyway, and dropped my mom and I off. We were about 15 minutes late, and the queue was so long! I saw familiar faces; Marta and Federock, and Camille and Anthony. They saw me right away and we waved excitedly to each other. They were way ahead in the line though. While in line, I Jon and his band from Hawaii. They were on tour here and they were the nicest people. We sat there in back of the line and talked for a bit. Then, everyone who had a stamp (which included me because I got my stamp two years ago) were led into the cafe first. I had no idea I was going to perform, I thought I could just get in with my ticket. The amount of people going to the Bluebird seemed to have multiplied since I last came. I asked the girl behind me if we are actually going to play and she told me that if you have a stamp, you're guaranteed to play. That's when I started freaking out. All along I thought I'd have a 1 in 100 chance or something. Barbara, the organiser came up on stage and called out the list of performers. I was second. First was someone who had kept his ticket for 6 years. He looked very familiar, but I couldn't quite pin point where I had seen him before.. I was pretty much shaking when I went up. I sang 'Dreaming'. I sure felt like I was dreaming. It was absolutely surreal. The next few people were trembling too, I'm glad I wasn't the only one. Everyone I met on this trip got to perform that night and I think we were all so excited about that. 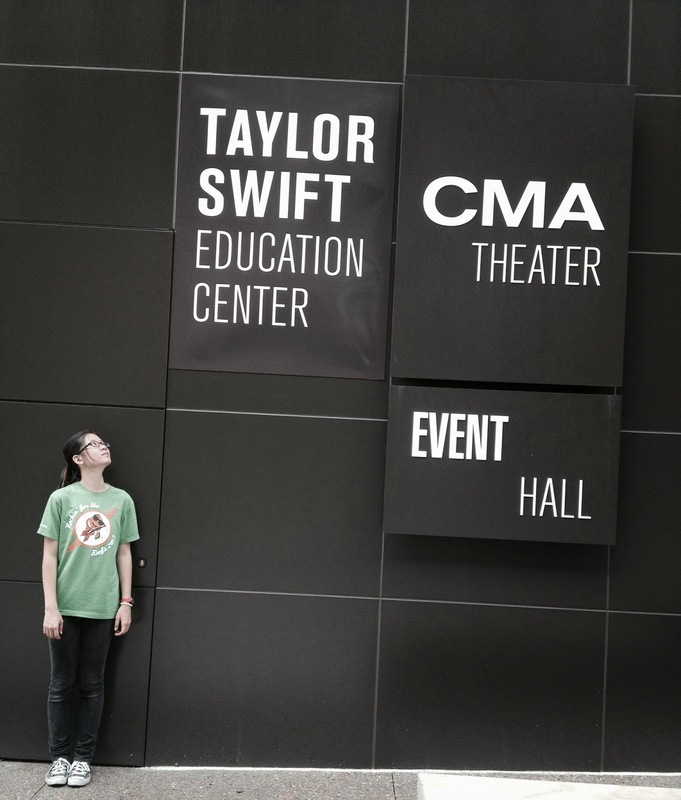 This was the place where they filmed a lot of the show Nashville, and also the place where Taylor Swift and Garth Brooks and so many others started their careers. It was so amazing to even be in here. "Oh, are you a singer?" "No, no don't say that. Say I am a singer!" I love how we're meeting so many people with so many stories to tell. They have traveled the world and its is so fascinating to hear about. Someday I'd like to do that too, although I am kind of doing that already. I'm missing out on a lot of things back home like camp, events, Taylor Swift's concert but I am here and I'm having the time of my life here. I can't thank you enough for all your support, getting me all the way here and all. See you soon! Into this dark and wonderful unknown. Let us go, let us go"
Time seems to go by so fast here. The days are longer because the sun sets at 8pm or later and rises so early in the morning. This week, we've been pretty busy at the hostel. I'd fall asleep and I wouldn't even hear the noise coming from next door. It's getting hotter and hotter here; and it probably is in Malaysia too, but I wouldn't normally walk 30 minutes in the hot sun back home. Over here, I've been doing it almost everyday. I counted that takes me 3700 steps to get to the hostel. This week, I did quite a lot of room cleaning. I'm enjoying it as much as I can possibly enjoy cleaning rooms. I don't make my bed everyday back home, so I think this is a lesson because I'm making so many beds and folding so many blankets here that I'm pretty sure it has become automatic. 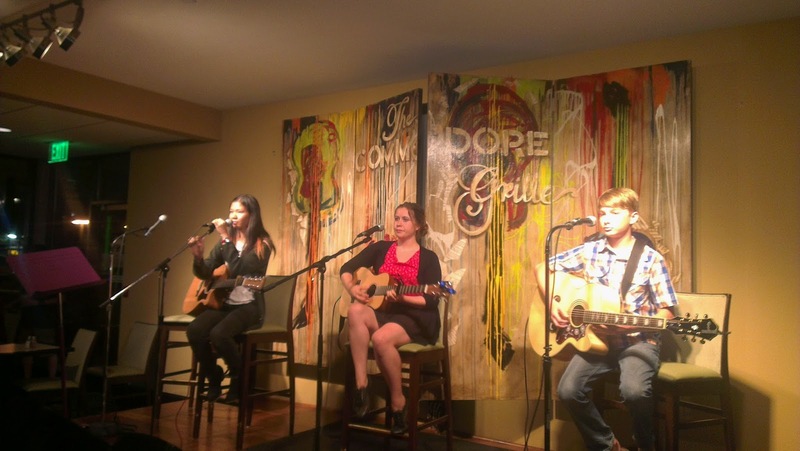 On Sunday, I played at Debi Champion's songwriter's night again. My mom and I ordered a giant brownie. It tastes so good, but it is gigantic. This time, the writer's rounds weren't as long. It was Father's Day and there were a lot of families out celebrating so the restaurant was pretty full. Then these two guys came up on stage to perform. They seemed to be really good friends, and they played really great songs. They were Guy Gilchrist, the artist for the Nancy comics and Eddie Kilgallon, an amazing songwriter, who wrote songs for George Strait and for many charity organisations. Mum and I went to get their autographs. Guy even drew me a cartoon on my notebook. They are such accomplished artists and they still play songwriter nights and are so humble too. That's so cool. When it came to my turn to play, it was the last round of the open mic segment. There are scheduled songwriters at the beginning and when everyone scheduled has played, the open mic starts. I sang a song of mine called 'Box Full Of Memories'. I only play that live sometimes because I am very sure that I want that song on my next album (here I go thinking too much again. My first album isn't even done yet). The response from my song was pretty good, and people came up to me said they liked my song. I felt really happy. Debi told me that next time I could get scheduled, and I'm going to be playing as a scheduled performer at the end of this month! I'm so excited. On monday, after I was done with my shift at the hostel, mum and I went to watch The Song Suffragettes at The Listening Room Cafe. Brittany, whom I met at The Martin Guitar Booth two years ago as well as this year was playing with Maddie Kozak, Kalie Shorr, Lena Stein, Daisy Mallory (!!!) and Brittany Kennel. 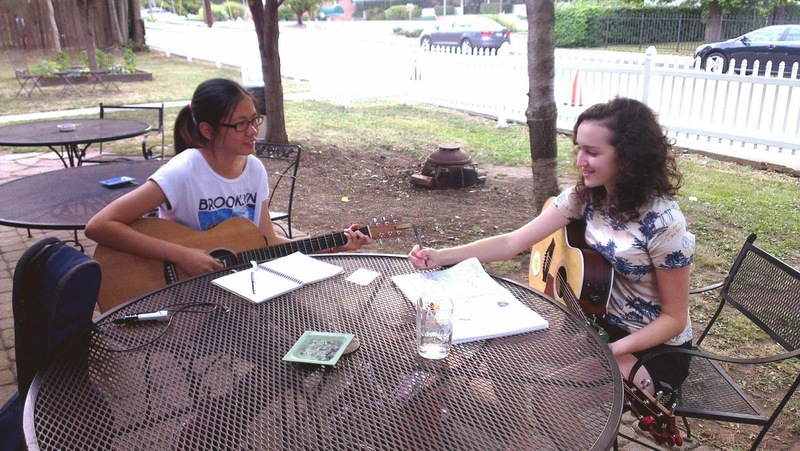 Song Suffragettes is a songwriter's round just for girls to play. All their voices are so amazing. The whole setting of it reminded me a lot of The Bee back home in Publika. Tuessday: Cleaned rooms again today. Found a whole bunch of pennies, or one cent coins. I heard that is is good luck if you find one, but I found so many. I was worried that it might have the opposite effect. On my way back, I stopped by the grocery store to buy some fruits and food. If you're going to walk for 30 minutes in the hot sun, don't buy bananas. They weigh a lot. I was really hungry by the time I got back because I didn't eat lunch, so I cooked noodles with salted vegetables. We bought those from an Asian market. After lunch/dinner, we walked to Cafe Coco. They have open mics every tuesdays and thursdays. "You have to go to Cafe Coco" is basically what I've heard from people here. The cafe is a quirky little cafe in a house. They serve cookies the size of your face and cakes the size of bricks. Well, almost the size of a brick. We had a 'fountain drink' (sprite) and a new York Cheesecake. Everything has to be shared with my mom here because of their abnormally large food portions. The open mic itself is located at the back of the cafe. It was a very artsy kind of vibe, not like the typical Nashville country kind of style. I met a few of the girls who were staying at the hostel and a girl named Jackie and her mom. We were the only two who came with our moms, and turns out we have a lot in common. We both love Ed Sheeran's music. All the open mic-ers sat behind and jammed out before the show started. It was so amazing getting to be a part of that even though I didn't know the songs they were singing, but I just sat and listened. The first open mic, Taylor sang the most amazing song that he wrote. Everyone was so amazing actually. Jackie sang before me, and her voice is just so amazing and unique. I feel like I'm a fan of almost everyone in this town so far. I hardly use my iPod when I'm here because there's so much good music to listen to everywhere. I got to sing two songs that night, and the response was nothing like I've ever gotten before. It really surprised me. I'm so happy that my songs are being accepted here and people like it enough to ask for my sound cloud links. A lot of hugs were given, which was nice and everyone in this room were in a state of "I can't even" because there was just so much amazing talent in the room including a girl who played the flute and beatboxed at the same time. I mean, how amazing is that? Most of us weren't from Nashville, and we were all so, so, so excited. Walking back was like walking on clouds. Only I have never walked on clouds. It was like what I thought it would be like walking on clouds. I would've skipped all the way home if I wasn't carrying my guitar with me. On wednesday, It was super hot outside, but freezing inside. I cleaned rooms at the hostel again. It wasn't too busy, so we could relax a little. I traded lists of my favourite music to listen to on Spotify with Tracee. We have similar tastes in music and she introduced me to a lot of artists I didn't know about before. Thursday (today: I got up really early this morning and took the bus this morning to the Bluebird Cafe to attend a 'Pitch For Publishers' workshop. It is a workshop to teach you about songwriting, commercial country music, and how to pitch songs to publishers. I didn't get selected to pitch to the publishers, so I just went to audit. I saw Jackie, and Rachel there too and it was nice to see some familiar faces. We went really in-depth of hit songs and analysed their meanings, song structure, and themes. We all got to pick a song to discuss and brainstorm about. I was most afraid of speaking to the group of people about how I felt about the songs. That's why I write songs; to avoid the whole 'speaking your mind' thing because songs will say it for me. I'm glad I had to do it though, because I definitely need to learn how to speak up more. The workshop ran from 9am to 4pm. After that, we were supposed to head to this place called Ri'chard's Cafe for an open mic. All the participants get to play. I met my mom at Bluebird Cafe and then got a taxi there because it was too far to walk. We shared the taxi with two other people who were heading downtown. To get to Ri'chards, we'd pass downtown so we decided to go together because taxis are really hard to find here. Then the taxi driver forgot about sending the two other people to downtown and we got lost on the way to the cafe. We drove past houses and shops that started to get further and further apart from each other and we were definitely out of the city. We took a really long way there and it costed us a lot. This was when every participant got to play their songs and network. I got to sing two songs. I'll post a video of it up in the next few days. Promise. I had so much fun. There were so many amazing songwriters, it is so inspiring. Everything is changing so quickly in the music industry. Sometimes it can be very scary not knowing what's going to happen next. But if anything changes, I just want to remain optimistic and remain who I was when I started this journey into the wonderful unknown. I've been here in Nashville with my mom for almost a month. Has it really been that long? I'm missing ice skating and ballet and all of you guys back in Malaysia a lot, but the internet makes the distance seem smaller. A few of you asked me how I'm doing here and I always say "good". Not because there's nothing much to tell you, but there's just so much to say that I'm not sure where to start. I'm also not much of a talker. I've been spending very little time on the internet since I got here. There seems to be a lot of things going on outside of this computer screen and by the time I get back, I'm either too tired or too hungry. Or both. I've been pretty busy these few weeks. I haven't been writing much and I'm feeling like I'm going crazy. I can only go so many days without writing anything down. It has been about a week and my mind is racing with words, lines, lyrics, rhymes... So I'm just here trying to pick up little fragments of songs here and there. The public transportation is not exactly the most reliable here so my mom and I have been walking a lot. 10,000 steps a day is a lot further than I thought it would be. Most people here drive and don't take the bus, and there isn't a train here. That makes me appreciate the LRT more I guess. It's also been really hot. Probably not as hot as it is in Malaysia, but the weather makes it feel like we're not too far away when actually we are. 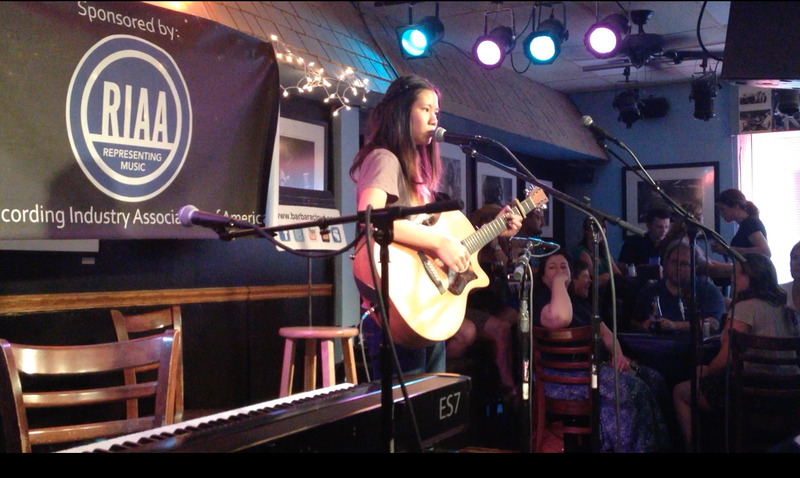 I attended a Pitch To Publisher's workshop at the Bluebird Cafe last week. It was the most amazing experience I've had being in a room full of songwriters around my age. I did not get selected to pitch my songs to the publishers, but I was allowed to audit the workshop and learn the process of pitching songs and what it takes to be a commercial country songwriter. We are constantly reminded of how difficult it is to succeed in this industry, and I think that probably brings me back to reality a little more. It's a good thing though. It makes me want to work a lot harder. I don't quite think I have what it takes to be a "commercial country songwriter" although I do love country music. Waylon Jennings did say: "country music isn't a guitar, it isn't a banjo, it isn't a melody, it isn't a lyric. It is a feeling." so I'll just write about my thoughts and feelings and try not to think to much about the genre. During the workshop, I met so many wonderful people whom I have so much in common with. And the fact that we all scribble lyrics on everything and can use "we should write a song about that" in a regular sentence is so cool. I love how in Nashville people want to hear original music and they really pay attention to the lyrics. We also love pizza and salad, but who doesn't? On the last day of the workshop, the auditors of the workshop got to play their songs for the participants to critique and comment. We had to prepare 35 lyric sheets, but I didn't want to pay 25 cents per sheet because that is a lot of money to spend so I wrote them out. Mum helped me of course. I played them my song 'Here'. I got comments on it being a little too vague for country music and it also had too many rhetorical questions. But overall everyone enjoyed it and suggested I try to get it to TV placements. The most memorable comment I got was when someone said they could imagine it played in the background of Finding Nemo. There was also a little party at the end of the workshop. We talked about boys and music and food. Well, I mainly listened but I was not as quiet as usual. We also sat in a circle and passed a guitar around, each taking turns to play our songs. It was like a giant songwriter's round. It was so inspiring, and amazing. I got to play my song 'Dandelion Days' and have everyone sing along at the chorus. I have never felt like I really belonged anywhere until that night. It was back to reality after that weekend. We were free on Monday, so we went to The Bluebird cafe again to try to play at the open mic. The line was so long by the time we got there, we were in the third line. I saw some friends I met at the workshop and made some new friends while we were in line. I thought I wouldn't get a chance to play because we were so far behind, but I got to play! We didn't get to go in, but I got to play. I wasn't as nervous as I was the last time, but I was still nervous. It was so much fun. Because we didn't get a seat in the cafe, after my performance we had to leave. I took mum to Whole Foods, my new favourite place to eat. It's not easy to find vegetables and fruit, but in this area there were plenty. And one of the best parts about eating at Whole Foods is that we could take the amount we wanted to eat and not worry about bringing a box so we could pack the leftovers. We ate in quite often but we did eat out too. When we ate in, mom would try to re-create chinese dishes with american ingredients. She managed to make herbal eggs, which tasted awesome. When we eat out, we normally order for one person and share. Food is usually served in such huge portions here. 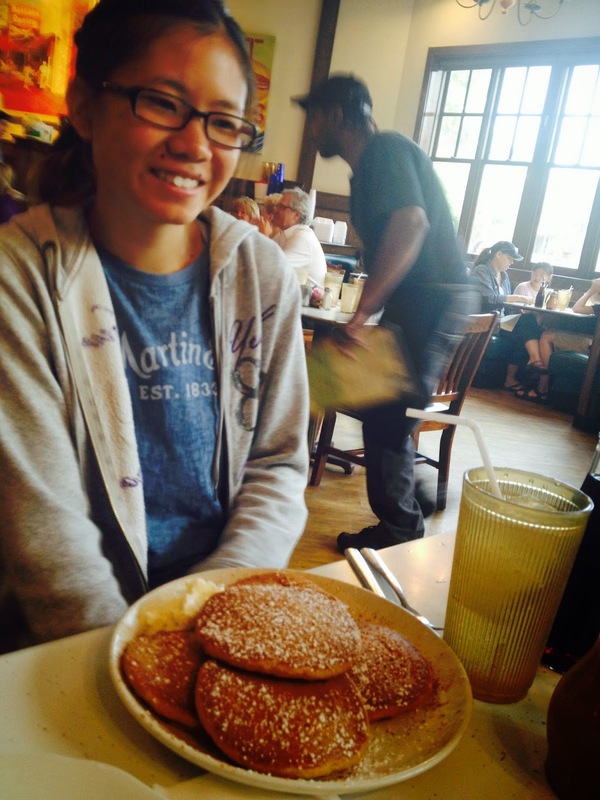 I had pancakes the other day at the Pancake Pantry (where Tim McGraw, Faith Hill, Taylor Swift and many other celebrities go to eat) and that one plate of pancakes I ordered was enough for about 2 meals for me. Nashville has quite a lot of barbecue places to eat, but I don't eat barbecue. I don't even know how to spell barbecue, but autocorrect helped me out with that. We were quite free the other day and decided to bake something with the ingredients we found at the hostel. 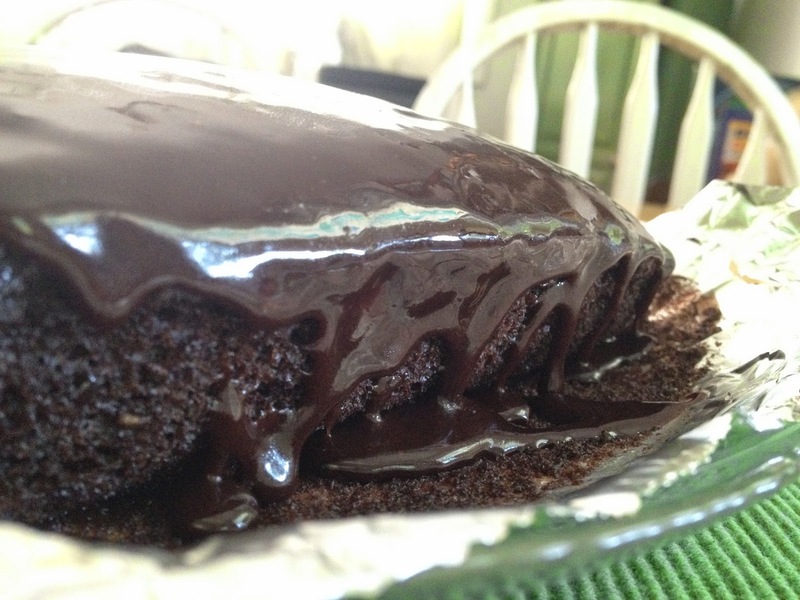 We made a vegan chocolate cake to share with everyone. We haven't done much touristy things, so the other day we explored downtown a little. We went full on tourist mode taking pictures of everything. Most of these pictures were taken by my mom. As I'm writing this I'm Skyping with Sam and Arian. We've been chatting for about 3 hours about almost nothing significant. So yeah, that's how/what I've been doing lately. Time seems to be moving so fast, yet so slow at the same time. I want to go home, yet this feels like home at the same time. I'm going to need more time to process everything. Thanks for reading until the end of my current ramblings by the way. The weather here has been hot and cold like the Katy Perry song. It's been freezing in the morning and scorching hot in the afternoon. It's confusing. I heard the weather back in Malaysia has been pretty bad, so I hope you've all got your masks and are staying hydrated. I feel like I'm in a dream, and going to sleep is actually waking up. I got scheduled to play in the round at Debi Champion's Songwriter's Night. The way it works here is that you have to sign up and be an open mic-er a few times before you can get scheduled, and I'm so happy that it was on a day like this. It was so much fun, I think I'll play there again. 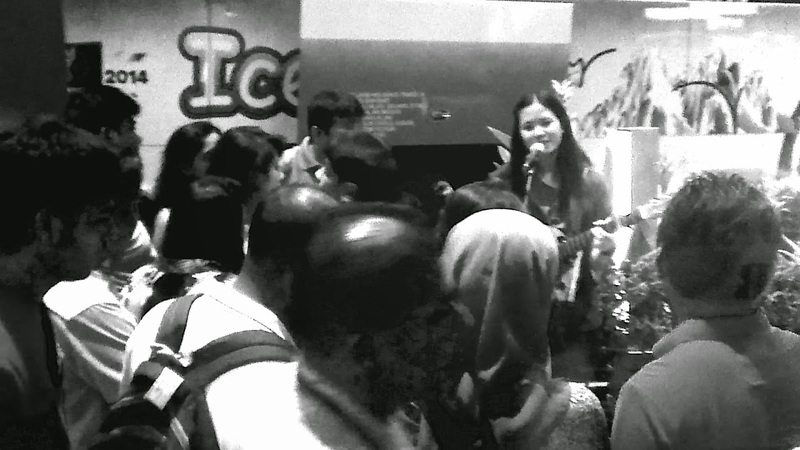 We went to Cafe Coco again for the open mic but we were late and sign ups were full. They only allow 12 people each time and we were late because I was baking cupcakes with Amanda, one of the guests at the hostel. Since we were already there, we decided to stay for the show anyway. It's always fun at Cafe Coco, because you'll never know what to expect. I love the flute/beat-boxing act. Towards the end of the open mic, Cody who runs the open mic here asked if I wanted to play. Of course I said yes. And I ended up being the 13th performer that night. Then on Thursday, I played at Ella Mae Bowen's 'Unplugged at Atmalogy'. That was the highlight of my week life. It was surreal. The next day was America's independence day. 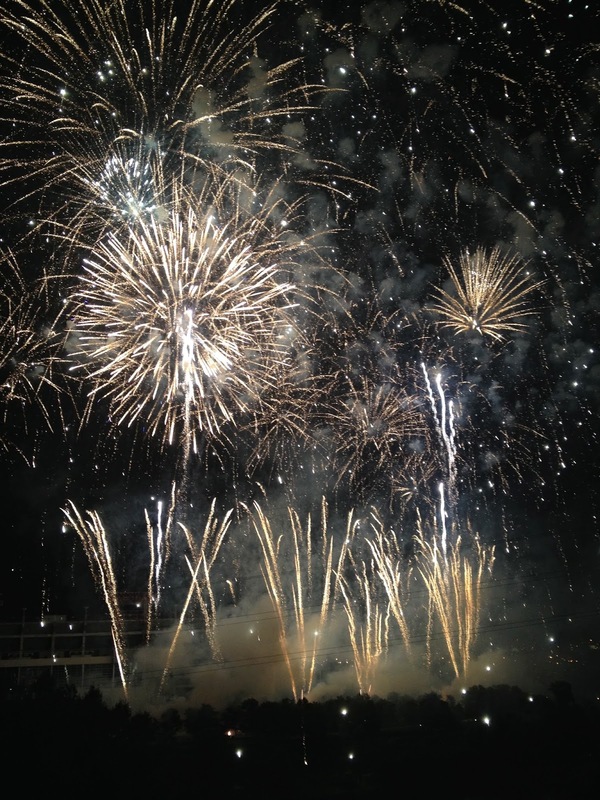 We saw the most and mesmerising fireworks display. It was also the longest we've ever seen. It was magical and mesmerising. We stood on the roof right in front of riverfront and it was awesome. My mom and I had never experienced 4th of July in before. We hardly ever go to the parades during Merdeka either, so being right in the middle of one of the biggest celebrations in the US was pretty crazy. Best fireworks ever. We did some touristy things like visiting the mall, walking around downtown, eating gigantic pizza and taking lots of photos so this week, we decided to stay in more. We've been going out a lot and I hardly had anytime to write, so that's what I did. There's a little space in the garden of the hostel where people can hang out and mainly smoke, but when no one is there, that's where I'll be. I'm that girl walking around humming to herself, thoughts filled with words, scrambling for a piece of paper. I realised that most of my ideas come when I am busy. There's also a piano at the hostel downtown and I'd play a little there too whenever I can. Or when there aren't too many people around. I've been dreaming about home a lot lately, which is weird. I had not anticipated this strange mix of happiness and sadness to hit me os hard. Sometimes I don't know if it's my gut feeling I'm going with, or if it's the fear of things not working out that is clouding my judgement. Following your heart is good advice; but sometimes it's hard to tell if you're following your heart, or conveniently running from your fears. I guess what spewed all this was when I got asked if I wanted to stay here longer than I had initially planned to. I spent a long time contemplating it, but eventually I decided not to stay on. I love this place and someday I'd like to live here but being so far away from family is hard. It's even harder if something happens and you can't just be there in the next few hours. I'm off to help out at the hostel now. Folding sheets and cleaning rooms. It's still enjoyable and I'm still optimistic about it, so it's all good :) I'll write more later! "Travel not to find yourself, but to remember who you've been all along." It was actually 65 days including all the travelling through changing timezones. I've been home in Malaysia for a month and have yet to write about my recent adventuring. "You need to tell people what happened. You have to write your report and tell people what happened" my mom tells me. Ahh, the life of a homeschooler.. consists of a lot of report writing. But honestly, after being home for so long, I'm still thinking about Nashville. I'm still reminiscing, and I'm still wishing I was there. It's like the feeling you get after reading an awesome book, and its so awesome that you don't want to read another book because you feel it wouldn't even come close. I actually did read a very good book and am currently not really reading anything else but that's beside the point. So where do I start, where do I start? The past few months could very well have been the best two months of my life so far and this is my "report". I started my adventure saving up for the actual adventure. Because life isn't just about the destination, it's also about the journey. And what a journey it was-- I raised funds on GoFundMe, did a couple of recitals and sang on the street. I'm so grateful to everyone who helped me chase my dreams. Why Nashville? Because I wanted to attend the annual country music festival (CMA Fest) and two workshops there: Pitch To Publishers workshop, and NSAI's Song Camp. 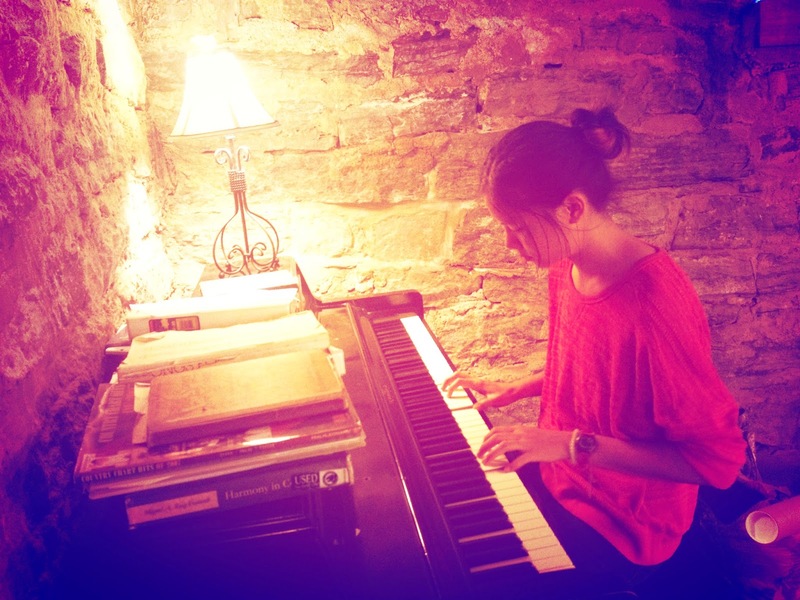 I wanted to learn more about songwriting, and to see how my songs would be received. While in Nashville, my mom and I volunteered at a hostel. I walked from midtown (where we were staying, and where my mom volunteered) to downtown (where I did most of my volunteering) everyday. It took me 30 minutes to walk there, and 30 back. 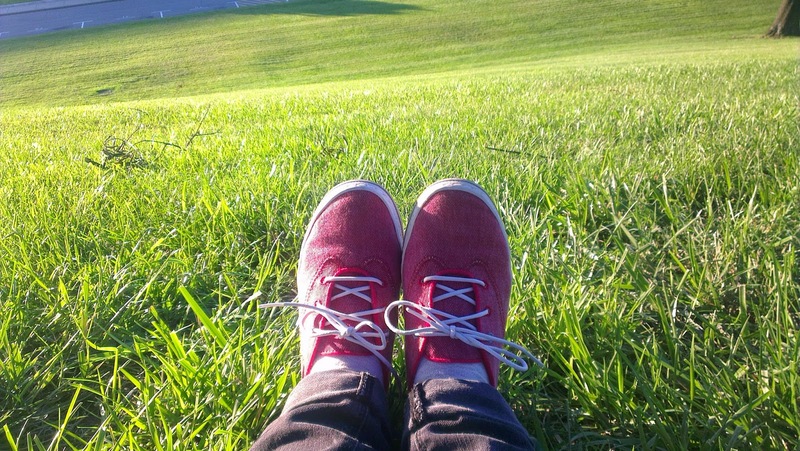 I walked until there were holes in my shoes and tan lines where I wore my watch but the time I spent walking gave me a lot of time to think and write songs, which I did. I must've looked like a crazy person, singing into my phone and all, but I must say; I have come up with songs while walking back and cleaning rooms that I'm very proud of. The last few weeks in Nashville flew by. I didn't want to leave, but I missed home at the same time. Oh, the irony. But before we left, I had one last scheduled performance and a couple more writer nights and open mics to attend. And of course I had to go to The Bluebird Cafe one last time to sing and to say hello and goodbye to the wonderful people I've met there. Till next time at least. I performed at Jack Scott's Writer's Night at Renaissance Hotel. Two years ago, I played there for the first time when it used to be held at Hotel Indigo. It's funny how so much has changed, yet so much is still the same. I met the most amazing people there that night, and had so much fun performing. I also attended NSAI's Song Camp. There were so many people of all ages and all genres attending. I met someone writing songs for Broadway, and someone who writes the most amazing dance music. The first day of the workshop felt like the first day of school; there were mums reluctantly saying goodbye to their kids (my mom was one of them) and people getting to know each other. I sat way at the back of the conference room (of course) and talked to people. Okay, okay I tried to talk to people. I didn't feel as awkward there somehow. Maybe its because we were all crazy about songwriting and so we have so much to talk about, I don't know. The workshop was 3 full days of insanely awesome lectures, song sharing sessions, song critiques, and networking. We explored deeper into lyrics, melodies, songwriting methods, hooks and co-writing. We each got a song critique and got to listen to hit songwriters tell their stories behind their songs each day. I loved hearing about how the songwriters wrote their songs. Anything could be an inspiration; it could be a colour, or a word, or a movie. Sometimes it started off with a guitar, sometimes a piano, and sometimes they'd write to programable tracks. During one of the sessions, we got to hear the entire process because they recorded it all. It started from beats, then moved on to a couple of words and a lot of mumbling, then the demo and finally the radio version. It was so fascinating! Hearing them share their experiences was both inspiring and reassuring. I was especially nervous about my song critiques. Each time I passed my lyric sheets around, I could hear my heart pounding, and I hoped no one else could hear it. During the breakout sessions there weren't many people because we were broken into smaller groups. I never had my songs critiqued before, and after attending the workshops, I realised my songs weren't exactly following that "rules". I don't always follow the general song structure or write to radio-friendly song lengths. One of my songs; 'Dreaming' didn't even rhyme. I was SO surprised that for all the 3 song critiques, I got very good feedback for my songs. It's not that I doubt myself that much (I do, a little. But only a little. Okay, maybe a little more than a little.) but these were professional songwriters. Some of them had won or had been nominated for many awards including Grammys. I couldn't comprehend it. I still can't. I made new friends, and got asked to do some co-writing. I had never co-written before, so all this was so exciting and new to me. I managed to squeeze co-writing sessions with Olivia and Diana on my last 3 days in Nashville. It's a very interesting process; learning how other people write their songs and how to write a song together. It was too soon to be packing my bags all over again. We had a lovely southern breakfast with our friends at the hostel and went to the airport. The journey home felt so much longer than the journey there. The constant change in timezones resulted in me giving my family the wrong arrival date, but by the time I realised my mistake, we were thousands of feet in the air above Chicago and there was no way to let them know. I had learnt so much and I feel like I've grown more in my songwriting. I read an article recently about why people like to travel. It's not just the being-in-a-new-place kind of rush, but it is the energies you get from being in a place where everyone is excited to be there. How everyone travelled to the same place you're travelling to for almost the same reason. It also talked about how after you've come home, you'll always get the urge to travel again. The buzz will disappear, and it said that no matter how much you think had changed, it will all be the same again as you go back to your ordinary life. I don't want to go back to who I was before all this adventuring. I don't want to stay completely unchanged. After many, many flights and long naps on the plane, Nashville didn't feel real. But there were photos, and souvenirs. I even packed dandelions in my suitcase. Not the small ones like we have in Malaysia, but the big ones the size of your fist. So it had to be real. I don't know how to express how thankful I am to have been able to experience all of this. And to have experienced it with my mom. I thought I could do it on my own, but I don't think I could. She likes to rub it in my face all the time- the fact that I did actually need her there, and really enjoyed her company. I'm so grateful to everyone who had supported me. Thank you so, so much for believing in me. I can't wait to share some exciting news with you!